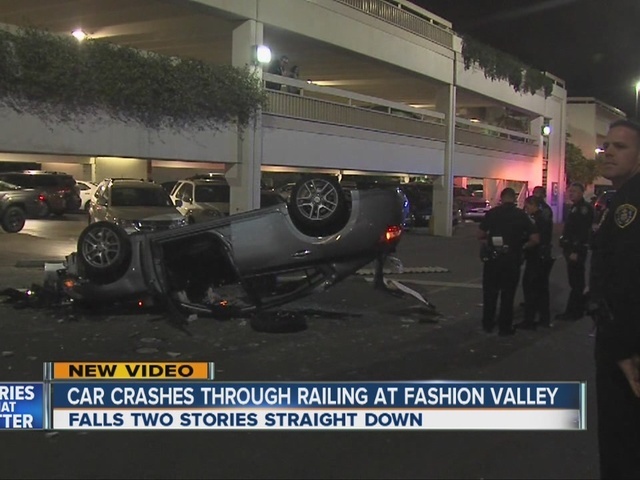 SAN DIEGO -- Two women were seriously hurt after their car plunged from the third-level of a parking structure at Fashion Valley Mall Sunday night. The fall occurred just after 7 p.m. in the 6900 block of Friars Rd., across from the Nordstrom’s department store. Police say the driver accidentally hit the gas instead of the brake, a mistake which sent the two occupants crashing through the barricade and hurtling over the edge, 40 feet straight down to the ground below. The two women were breathing and conscious when San Diego Fire-Rescue firefighters pulled them out of the crumpled car, according to officials. They were transported to a nearby hospital with undisclosed injuries. A witness who captured cell phone video of the aftermath described the scene to 10News. "Honestly they're very strong women, when they pulled them out of the car, they were still walking," Natalia Somo said.